Community Financial Money Matter$ Blog: What Good Could You Do with $1,000? The season of summer brings warmth, flowers…and $1,000? Community Financial Credit Union is gearing up for another “Summer of Sharing.” Throughout the summer, beginning June 7, Community Financial will donate $1,000 each business day to a deserving non-profit. Summer of Sharing, now in its third year, invites the community to nominate non-profit organizations that are doing exceptional work in their communities, by sharing a story that explains how $1,000 would help accomplish goals that in turn, help the community. Community Financial team members present a check for $1,000 to the Lighthouse Family Charity organization of Michigan during last year's Summer of Sharing. Since the inception of Summer of Sharing, Community Financial has donated over $120,000 to non-profits in the area and plans to donate an additional $60,000 this year. So, as you kick off the summer, think about a charitable organization that helps your community. 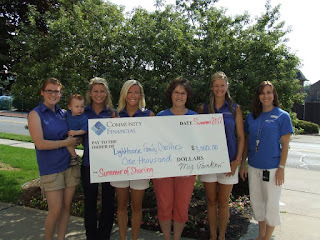 To nominate your favorite non-profit and to see who receives $1,000 each day, visit www.SummerOfSharing.org.